Dorset is most famous for its 200 million year old Jurassic coastline, being the location setting for the popular TV series Broadchurch and is also home to a huge naked chalk Giant! Furthermore UNESCO has declared the 140 km stretch of coastline a Natural World Heritage Site and the beautiful countryside of Dorset is an area of outstanding natural beauty – what better way to see the stunning rural views and pretty towns of Dorset than from a hot air balloon! Our launch site in Dorset is located to the north of the county, far enough away from the coast to allow us to float gently with the wind towards the south of the county or across the Blackmore Vale and sometimes into Somerset or Wiltshire. Poole, Bournemouth, Wareham, Broadstone, Warminster, Stourton, Tisbury, Gillingham, Farnham and Blanford Forum, Weymouth, Dorchester, Bridport and Lyme Regis are all easily accessible to our Dorset meeting location at Henstridge Airfield. Henstridge Airfield: conveniently located between Shaftesbury and Sherborne and easily accessible from most locations in Dorset, Somerset and Wiltshire. A picturesque location on the Dorset and Somerset border set amongst lush green valleys and wooded hills. Flights from Henstridge are wonderful whichever way the wind may take you. If you head towards Sherborne, you can see many medieval buildings still standing in the town Sherborne, along with the Abbey, the famous historic Sherborne Castle built by Sir Walter Raleigh and views of unspoilt heathland, the river Store and the Blackmore Vale. Or, if you head to east in the direction of Shaftesbury, you will see one of England’s oldest and highest towns with a history dating back to medieval times and a wealth of tradition. The town was much loved by Thomas Hardy and is used in some of his novels. 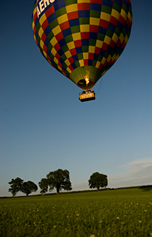 Balloon Flights from Henstridge Airfield frequently provide distant views as far away as Weston Super Mare and The Severn Bridge to the north, Poole and Bournemouth to the southeast and Chesil Beach and Lyme Bay to the south. Directions from the West From Yeovil, travel along the A30 towards Shaftesbury. Continue through Henstridge on the A30 and after approx 1.5 miles, turn right by a brown ‘Golf Course’ sign. Continue along this road for half a mile and the airfield entrance is on the left and is quite easy to miss, the Airfield sign is small Directions from the East From the A350 at the Ivy Cross Roundabout turn onto the A30 towards Yeovil. Continue through East Stour and West Stour towards Henstridge and after approx 2.5 miles, turn left by a brown Golf Course sign. Continue along this road for half a mile and the airfield entrance is on the left and is quite easy to miss, the Airfield sign is small. If the Airfield gate is locked, please wait for the balloon crew at the gate. Drive into the airfield through the gate on the west side and follow the road, past some tall trees on your left. Turn left after the trees and park on the left by the fence ( there are a lot of tyres and generally some fuel tankers parked. You will be met here by your hot air balloon crew at the time specified on the weather line. Please note that there are no toilet facilities at the launch site.